The Gardens have three entrances – at Handel Street (1), Sidmouth Street (2) and Heathcote Street (3). South of the Gardens are buildings belonging to the Coram Foundation, a charity working with children and families. The site to the north is waiting for mixed use residential and office development. The south west corner was part of the original burial ground but is now a garden nursery, where there is also a development threat. AMortuary Chapel, now known as the Chapel of Rest. Built in 1806. BEuterpe, the Muse of Instrumental Music. Terracotta figure, one of nine muses which decorated the facade of the Apollo Inn (1898) on the corner of Tottenham Court Road and Torrington Place. On its demolition in 1961 Anthony Heal presented this statue to St Pancras. CLine of fragments of gravestones arranged to mark the separation of the two burial grounds. St George’s Bloomsbury (North) and St George the Martyr (South). DObelisk. Built for Thomas Falconer in 1729. 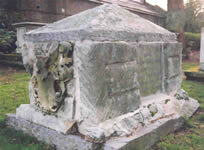 ETomb of Anna Gibson, died 1726. Sixth and favourite daughter of Richard Cromwell and granddaughter of Oliver Cromwell. Chest Tomb with armorial carving. FMemorial for Robert Nelson, buried here in 1715. A commissioner for building the Fifty New Churches, philanthropist and leading lay churchman. GJacobite memorial, placed in 2014 by the 1745 Association.